My name is Michele Tarsilla (@MiEval_TuEval) and I am a transformative evaluator with a focus on capacity development in international and cross-cultural settings. 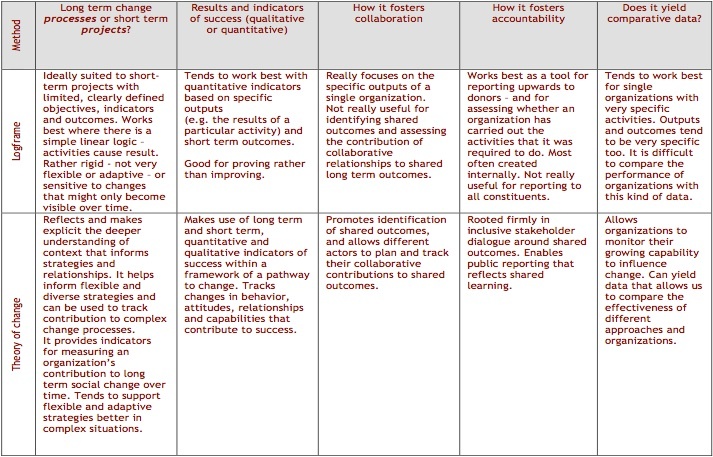 Having worked in 30 countries, I have become aware of the detached -and somewhat cynical- attitude that grantees organizations have towards their funder’s requirement for developing and using logic models (see the table below). As a result, the development of logic models has often been integrated acritically into organizational practices, merely as a simple “password for funding”. the ethical/professional (rather than contractual) obligation to be accountable to those very same local grantees and staff whose planning, monitoring and evaluation capacity development I am expected to contribute to. In an effort to promote a genuine understanding of how a logic model could become indeed an organizational asset (and by so doing, to enhance the ownership of both the final product and the process leading to its development), I have often asked my clients two things. First, to challenge some of those long-term goals recommended the funders and often inserted by default in the Logic Model template distributed to them). I particularly encourage them to translate those often ambiguous goals into lower-level objectives aligned with their specific vision. A small organization in Kinshasa that supported the professional development of young artists, for instance, did not see the relevance of including the Millennium Development Goal on poverty reduction –which the funder has assigned to them- as the ultimate rationale for their program in their logical framework. As a result, they replaced the goal within a different one (Increased support by the National Ministry of Culture for youth Culture and Development creations in the Kinshasa province”). Second, I invite local organizations and staff to combine the monitoring of activities and processes that funders are particularly interested in (e.g., for accountability and comparability purposes across project sites) with that of one or two additional programmatic aspects even if ignored by the funders’ guidelines. Furthermore, I push them for an ever more creative visualization of their respective programs inputs and results (“framers” will favor linear representations of program processes whereas “circlers” will be more keen at embracing a systemic and adaptive perspective of their program dynamics). The American Evaluation Association is celebrating Logic Model Week. The contributions all this week to aea365 come from evaluators who have used logic models in their practice. Do you have questions, concerns, kudos, or content to extend this aea365 contribution? Please add them in the comments section for this post on the aea365 webpage so that we may enrich our community of practice. Would you like to submit an aea365 Tip? Please send a note of interest to aea365@eval.org. aea365 is sponsored by the American Evaluation Association and provides a Tip-a-Day by and for evaluators. I need help with constructing evaluations for funding purposes. Can you help? I would like to construct program and organization evaluation for a non profit organization to submit with grant applications.